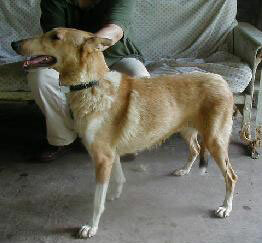 Lindsey was one of 51 collies confiscated from their owner by the Houston SPCA in Texas. 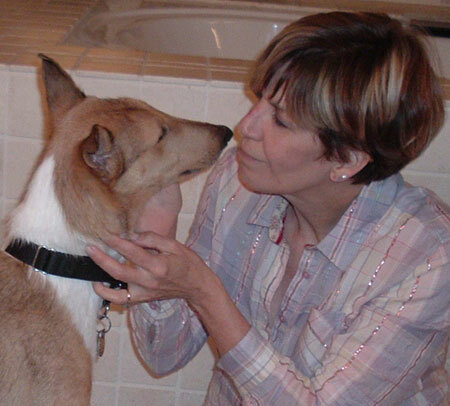 This case was very similar to the Yolo County and Montana cases, in that there were many more dogs than the owner could care for properly and there were apparently many unsupervised breedings and litters. 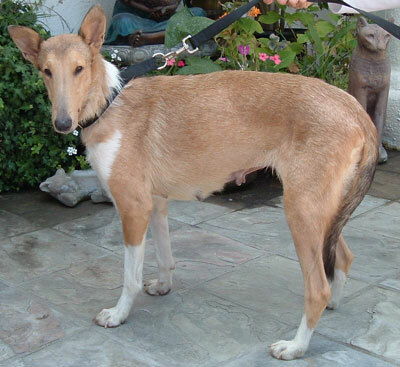 Lindsey suffered from the maladies of many of the collies. First and foremost, she is heavily heartworm positive, a condition that is inexcusable because the prevention is so easy. Second, you can see how many litters she has had by various signs of wear and tear on her body. Third, she is borderline micro-ophthalmic and has mild entropion, conditions that are genetic and could easily be prevented with sound breeding practices. NCR joined up with about a dozen collie rescues about the country to pitch in and help Houston Collie Rescue, when the SPCA released 41 of the collies to them. Houston CR already had dozens of collies in foster care and 41 collies at once would overwhelm any collie rescue. NCR volunteered to take in one collie in the worst mental or physical condition of the group. Another rescue, Collie Rescue Inc. of Maryland probably got THE worst collie (severest micro-ophthalmia, entropion and demodex), but NCR got one from the next-worst group. That would be Lindsey, about 4 years old. Lindsey after a few days in her new foster home in California, bathed, secure, and well fed. At first, the organizers did not want Lindsey to be among those collies travelling the farthest by road. Three of the collies were destined for the west coast, thanks to volunteers Mitch Telson and Denny Epperson who agreed to fly out to Houston and rent a van to bring the collies back with them. However, this option was determined to be Lindsey s fastest and best opportunity for treatment for her heartworm condition, given that all the other rescues had at least one dog in as poor condition as she. Lindsey did really well on the road. 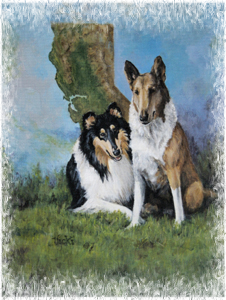 Mitch and Denny saw that as soon as the collies realized they were with friends, they were not stressed at all. They did very well during the 3-day road trip, eating and resting well, travelling peacefully in their crates in the van. On the left is Lindsey s intake picture when she was accepted into Houston Collie Rescue in early August. You can see how much she has improved already, after even a few days in her new foster home. Lindsey is much loved in her foster home--her fosterers have asked to adopt her. NorCal Collie Rescue offers you the convenience of donating through your credit card. You will receive a tax donation receipt once your billing comes through to us from PayPal. For your information, PayPal takes 3% + 30¢ to provide us with this service.